Since 2014, Nick Abadzis has piloted the TARDIS. 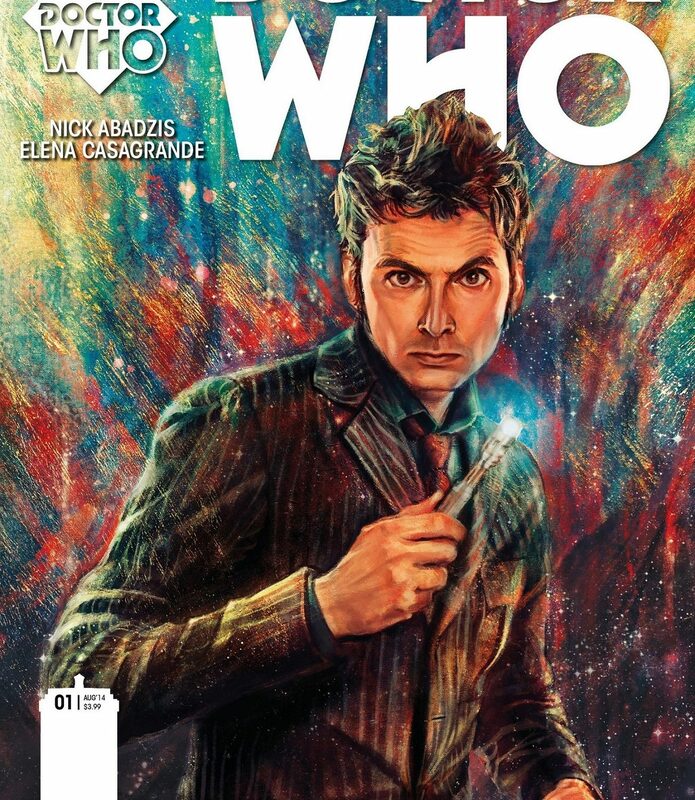 His extensive portfolio led Titan Comics to seek Nick out as the writer of their Tenth Doctor series. 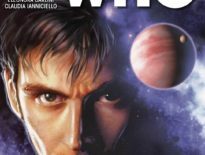 DWC: The last time you’d professionally written for Doctor Who was The Betrothal of Sontar for the Doctor Who Magazine; how did you get back into writing for the Tenth Doctor? I suppose it must’ve been quite an unusual experience before, writing that DWM strip only having seen a scene with Tennant in The Parting of the Ways (2005). Nick: Well, when I first wrote for him, I hadn’t seen the Tenth Doctor. I’d seen David Tennant in various roles on TV (in Casanova and Blackpool) and heard him in Big Finish audios, but I didn’t really know what the character of Ten would be like. Of course, the Doctor has certain basic characteristics throughout his incarnations, be it his curiosity or general disdain for authority figures, his sense of humour, so that was the approach – write it for any Doctor, but knowing he would sound like David Tennant. 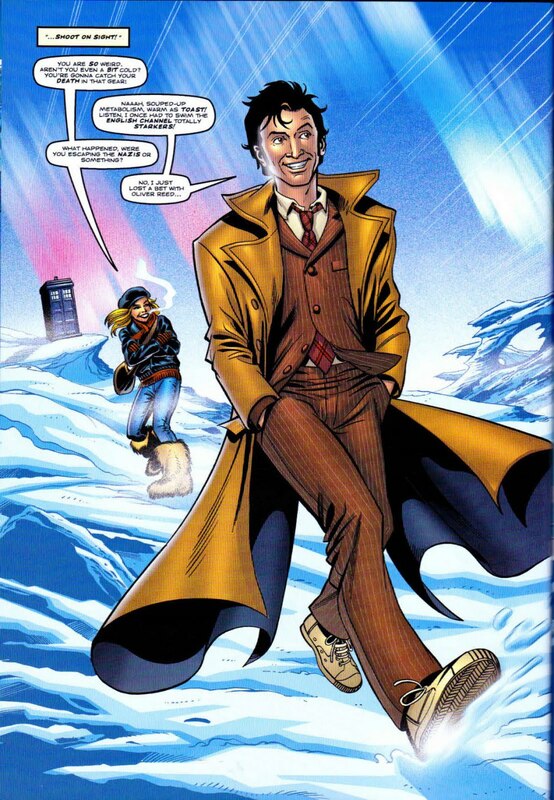 I think it came off fairly successfully: looking back at that strip now it feels like, with the input of the editors, it achieved a pretty good estimation of what Tennant would be like in the role. Plus, it was the only time I got to write Rose. The whole thing was written in an incredible rush, with little time for fine-tuning. Years later, I was approached by an old friend who was a senior editor at Titan Comics, who were pitching the BBC for the license. He knew I was a massive Doctor Who fan and wanted to know if I’d be interested in writing an ongoing series for them. At that stage I had no real idea what he was planning, but of course I said yes. 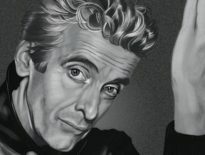 Freelancers say yes to everything, but it’s not often something like Doctor Who comes along. A couple of months went by, and I sent them some ideas for stories, again for a sort of “generic” Doctor because at that point, I still didn’t know what Titan’s overall game plan was. Then I was introduced to Andrew James, whose brainchild the Doctor Who line is, and he asked me to be the writer of the first arc of stories for the Tenth Doctor, which involved launching him with his own new comics-only companion. This was very pleasing to me, as it felt like I was returning to something I didn’t quite finish, plus I’d loved Tennant in the role. At that stage, the idea was that we’d alternate writers, or that each writer would get a turn at the different Doctors, five issues each, but as we now know, it didn’t turn out that way. After Elena Casagrande and I did the first five issues, Robbie Morrison wrote five, and we shared a lot of notes with each other, but I’ve been on it ever since. So, the first thing I did was rewatch Tennant’s entire tenure, which was a much more leisurely approach than my previous time. I took notes, but to a certain extent, you don’t just want to recreate the character as seen onscreen; you want to show the reader something new about him. You can’t really change the Doctor, and you don’t want to contradict what’s been established onscreen, but what you can do is show new aspects to his character, bring nuances and deeper layers to him. That was the intention at the outset, and hopefully I’ve stayed true to that. Tennant was a fabulous Doctor, and is still hugely popular, so of course I want to honour that. How did you approach creating a new companion, Gabby Gonzalez, her family and mates – especially her best friend (and eventually companion), Cindy? 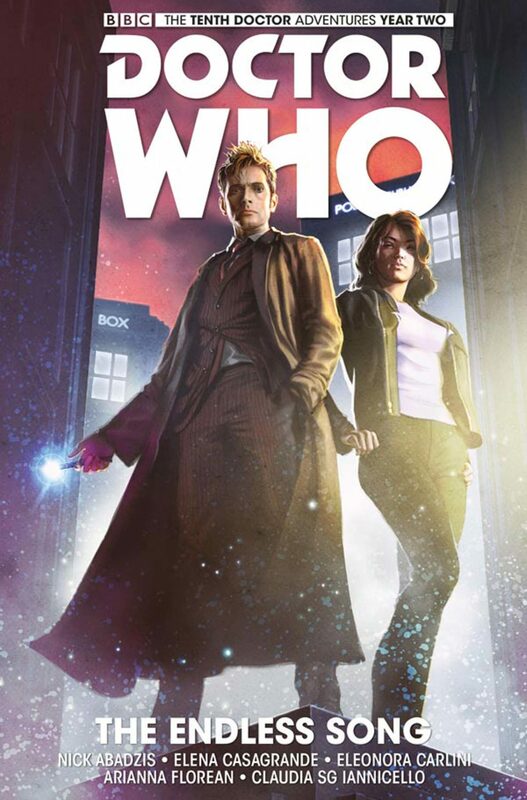 It was suggested to me by Andrew James, my editor at Titan, that our new Tenth Doctor companion could be an American, as, initially, these comics were intended for the American market. Also, there’d only been Peri, so it might make a nice change. We did throw a lot of ideas around – she/he/it could be an alien, a robot, that sort of thing, but the Doctor and female companion is a pretty great dynamic that we already knew worked, and without ever really meaning to, we veered towards that. I was keen to make her a native New Yorker as, although I’m British, I live there and I thought it’d be fun to base the Tenth Doctor in New York for a while instead of South London. I also thought it important that if she was supposed to come from a city as diverse as New York, we should represent that and, as the Doctor has (to our knowledge) never had a Hispanic companion, I pushed for her to be Mexican-American. Gabby’s from Sunset Park in Brooklyn, which also has a large Chinese-American population, so it seemed entirely natural to make that Cindy’s background. At that point, Cindy was supposed to just be a recurring, supporting character – we had no idea how popular and important she’d become. Gabby was designed to be a foil for the Doctor, but what I didn’t expect was how good a foil Cindy would be for both of them. Characters, if you let them breathe, really do have a life of their own. I’m currently writing Gabby and Cindy’s return to Sunset Park, so you’ll get a glimpse of their home lives again. Of course, they’ve both changed a bit since the last time they were there, and neither want to go back to their old lives. Although she loves her family, Gabby particularly chafed against it; she’s happy to know that the TARDIS is parked around the corner in the park so she can be whisked off to destinations unknown somewhere in the universe. You’ve got this great notion of her being an artist and sketching the universe as she goes: does this come from your love of drawing, or are you just a Turlough fan? My initial idea was to create a companion who would work in comics in a new way, in that she’d actually contribute to the stories themselves – you’d get an insight, through her sketchbooks and journals, as to how she experienced travels with the Doctor. The idea of her being an artist of some kind came early on. I knew she’d have a best friend – someone really close, who she grew up with, but like I say, at that stage I had no idea that Cindy would also become such an intrinsic part of the narrative. The sketchbook idea is perfect for comics, but a few of your stories revolve around music or sound in general, not something typically associated with comics. Was this a conscious decision to push the boundaries of what comics can achieve? Well, that’s just something I do as a matter of course. Comics is my natural language, my first mode of expression, if you like. If you look at all my work, it’d be difficult (although not impossible) to transplant it to another medium. I work with what I see as the strengths of comics grammar, which in some cases is a lot of absences – the absence of sound, of actual movement – everything is implied. I like to use the subtleties and possibilities of the medium and push it in new directions. Gabby’s sketchbook is a way of utilizing a natural strength of the medium, to give the reader a really up-close and personal insight into her experiences. To my knowledge, that’s never been done before in Doctor Who, not with the character actually illustrating their own journey anyway. Gabby’s drawings are actually all by Arianna Florean, who like me, has a much more cartoony style than the other artists, so it’s a really nice balance and differentiates Gabby’s drawings from the more figurative styles that represent the “reality” she lives in. Again, initially I roughed out what the sketchbook drawings would look like, but when I write them now, I just leave it all in Arianna’s very capable hands. As for music, the idea for that came from the idea that the “Doctor’s song is ending soon” [a theme throughout the 2009 Specials]. 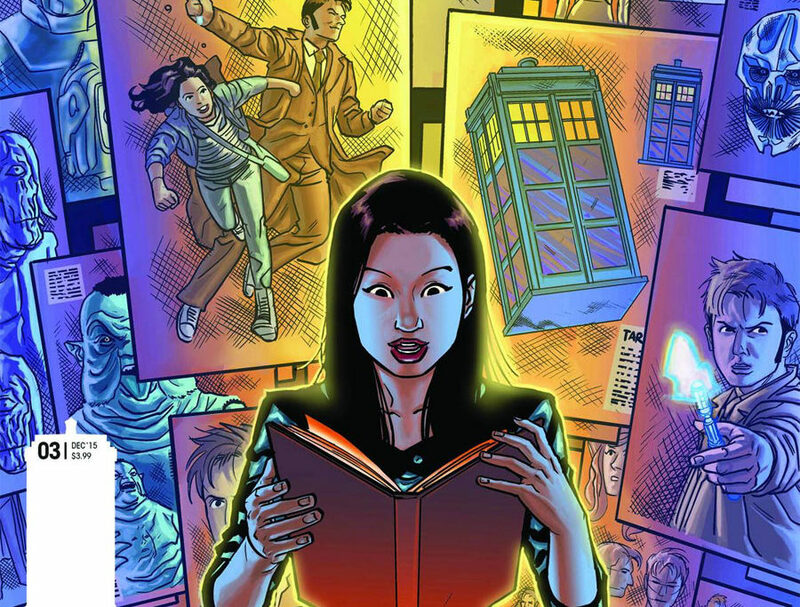 We established that Gabby and Cindy’s time as companions to the Tenth Doctor comes post-Donna, without being too specific about precisely when in his timeline. So, how soon is his song due to end? In a Time Lord’s life, that could be a long time compared to that of a human being. Making songs and music a recurring motif in his continuing adventures seemed like a good idea to me, as it continues that theme, and always has him being a bit twitchy, always looking over his shoulder. I love the nervous energy of the Tenth Doctor, so it seemed to play into that too. It also means I get to play with all sorts of musical ideas and translate them to comics. For example, Arena of Fear [in The Tenth Doctor #2.6 and #2.7] continued a lot of the ideas that were introduced in [the previous storyline] Medicine Man, of confinement, of gladiatorial combat as spectacle and entertainment, of the survival of different human species – it was a variation on a theme, with (hopefully) unexpected new turns and developments. Do you listen to music as you write, and if so, do you have certain playlists for different moods? Yeah I do, although I don’t really have any specific mood-related playlists. Music is very important to me – always has been. Many of my close friends are musicians, although I don’t know what bearing that has on me and the way I create stories… but I do have a vast library of music, the vinyl and CD parts of which are spread over two continents now (some of it remains in storage in my mother’s garage in the UK). Digital music is much easier to transport! I love the artifacts though – records and album sleeve art. I can’t listen to any music with human voices in it while I write though, as then I tend to get sidetracked and listen to lyrics, so I write only to instrumental music: mostly soundtracks, but some classical, jazz and ambient too. I was talking to [Dalek scribe] Rob Shearman about this – he does the same thing! Our writing process has some similarities.